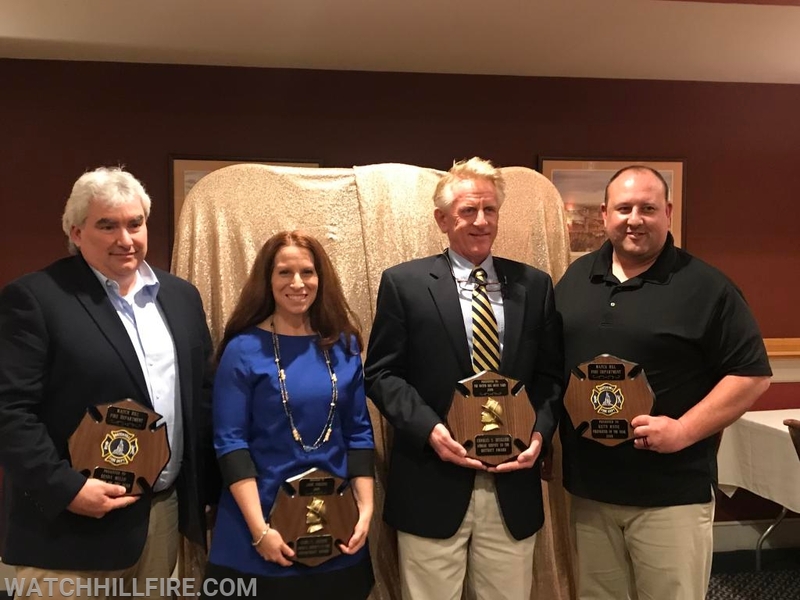 The Watch Hill Fire Department 2019 Annual Awards Dinner was held on March 15th at the Venice Restaurant. The dinner is held each year to thank all of the firefighters and their families for their hard work and dedication during the past year. Firefighter Keith Maine was presented with the Firefighter of the Year award. Lieutenant Dennis Mello was presented with the Member of the Year award. Lieutenant William Davis was presented with the Officer of the Year award. Captain Jane Perkins was presented the Carl Green Service to the Department Award. The Watch Hill Boat Yard was presented with the Charles Desillier Service to the District Award. Left to Right Lieutenant Dennis Mello was presented with the Member of the Year award. Captain Jane Perkins was presented with the Carl Green Service to the Department Award. The Watch Hill Boat Yard was presented with the Charles Desillier Service to the District Award ( accepted on behalf of the staff by their manager) Firefighter Keith Maine was presented with the Firefighter of the Year award.